Facing debt can be stressful and overwhelming. But it's important to remember that no matter how much you might feel that you're in over your head, debt is a hole you can climb out of. You can absolutely do this. Here are the first steps you need to take. The first step can be the most painful. It's time to get an overview of your debt, which means you need to add up everything you owe and take a good look at your total. That, my friends, can be a difficult moment. But that difficult moment will also provide you with the clarity you need to start taking back power over your financial future. Gather your financial statements or log in to the online portal for each account you owe on: your credit cards, mortgage, student loan, car loan, lines of credit, home equity loan, etc. Create a simple spreadsheet with four columns: one to identify each debt ("Student Loan"), one for the amount owed, one for the minimum monthly payment, and one for the interest rate. Pull your credit report to search for outstanding debts, and compare the information against what you have in your own records. Now it's time to start sorting out your spreadsheet entries so you can come up with the best possible plan to get out of debt. 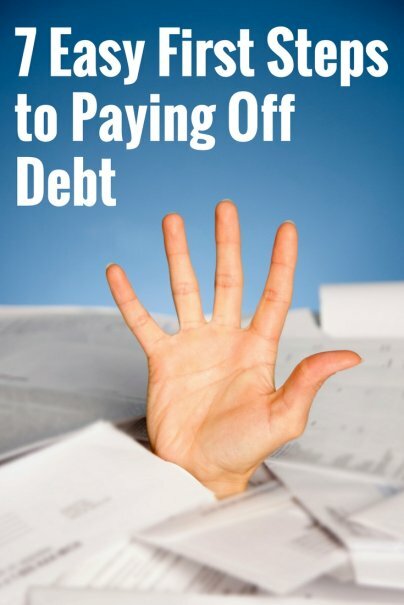 You might think that the most important debt to pay off is the biggest one; however, it's often a good idea to identify the debt with the highest interest rate and knock that out first. This is known as the avalanche method of debt repayment. Higher interest rates lead to faster debt accumulation and result in you paying a higher amount over the course of your debt repayment. The faster you can get rid of high-interest debts, the better. You don't get to stop making payments on the lower-interest debts, even though they're not the highest priority. Instead, you need to continue making the minimum monthly payments on all lower-interest debts while making bigger payments on your debt with the highest interest rate. Once you knock one high-interest debt out completely, you prioritize the debt with the next-highest interest rate and continue paying minimums on everything else. Add up the monthly minimum payments for all the debts on your list, including the highest-interest debt. This is the total, bare minimum debt repayment amount that needs to fit into your current budget. This can be a nerve wracking step, especially if you don't have enough income to comfortably afford that total monthly minimum amount. You may need to take steps to cut expenses elsewhere, or bring in sources of additional income. Now it's time to calculate the payment you need to get that highest-interest debt paid off as quickly as possible. If you keep making only the minimum payment on it, you'll keep accumulating interest charges and it will take much longer to pay it off. Instead, think of a target timeline (maybe six months or a year) for paying off the highest-interest debt, and calculate an ideal amount you can pay above the minimum payment to achieve that goal. Use an online credit card payoff calculator. Enter the information for your highest-interest debt: total amount owed, interest rate, and the minimum payment. You'll see how long it will take to pay off the debt if you only make the minimum payments. Now, instead of minimum payments, enter how many months you'd like to have it paid off in. The result will show you the monthly amount you need to pay in order to clear the debt within your target timeline. This takes some time, depending on the number of debts you have. Call each creditor and ask how you can reduce your interest rate. You may be able to refinance a home mortgage or car loan for a lower rate, for example. If you have a good repayment history, ask credit card companies to consider your reliable record and give you a better interest rate. If you're able to take out a low-interest loan, such as a line of credit or home equity loan with your bank, you may be able to use it to pay off your high-interest debt and consolidate at least some of your debts into a single, lower-interest loan. If you're late on a payment, being proactive can save you from accumulating fees and damaging your credit score. For example, if you call the credit card company and explain that you can't make the full minimum payment on time, they may work with you to split the payment in half for the month so you can avoid late fees. Many times, a phone call and a courteous conversation can reduce or remove a fee, extend a deadline, or result in a more manageable payment plan. Set up alerts or schedule automatic minimum monthly payments so you don't miss due dates. If you know you won't have the money on time for a particular payment, call in advance to negotiate an extended deadline or set up a split payment plan. Additionally, you may want to keep an eye on changes in your credit report.